ABOUT AMERICAN DIVERS INTERNATIONAL Serving Brevard for over 38 years! American Divers International is a small, family owned business operating on the Space Coast of Florida. In 1980, D.J and Edith Morin bought a small, run down dive shop on Merritt Island, Florida, and rechristened it "American Divers International" (ADI for short). Over the next decade, they opened two more dive shops, one in Titusville and another in Boynton Beach, as well as operated not one, but two large scuba diving charter boats out of Boynton Beach. By 1992, the energy needed to sustain D.J. 's "empire building" phase had run out and they sold off everything except the original store, deciding to focus their time and energy into a single dive shop. Over the next twenty years, American Divers has become a staple in our community. We've certified tens of thousands of people, and multiple generations of the same families! We've travelled all over the world, taking out customers on dive trips to the most exotic dive locations. We continue to believe that the customer is the most important factor when it comes to business. D.J. and Edith's son, Jeff and his wife, Becky have since taken over the business, allowing D.J. and Edith to enjoy their well-deserved retirement. We are commited to keeping the same customer-centered business model that D.J. established all those years ago. Scuba diving is a highly social sport. That might sound counter-intuitive since we can't exactly talk to each other underwater. But who needs words when we get to share the experiences of diving with Whale Sharks, Manta Rays, Morey Eels, and Goliath Groupers with each other?! Unlike other industries where little to no relationships are made between the customer and the person working behind the counter or an automated online "shopping cart" (i.e. Wal-mart, Amazon), everyone at ADI are divers and we want to talk diving, hear about your experiences, and go diving WITH you! ADI exists only because of our customer's support. We provide you with the services and products you need in order to participate in the sport you love! Supporting Local Business: Each and every ADI Staff Member, Instructor, and Divemaster lives and works in our local community. PADI 5-Star Training:For 38 years, ADI has been a PADI 5-Star Training Facility, the highest rating possible. That means you're guarenteed to receive the absolute best training possible! We know the best dive sites: We provide Local diving with the best charter services in South Florida - We take the time to schedule dive trips for you, so you don't have to worry about the hassle! 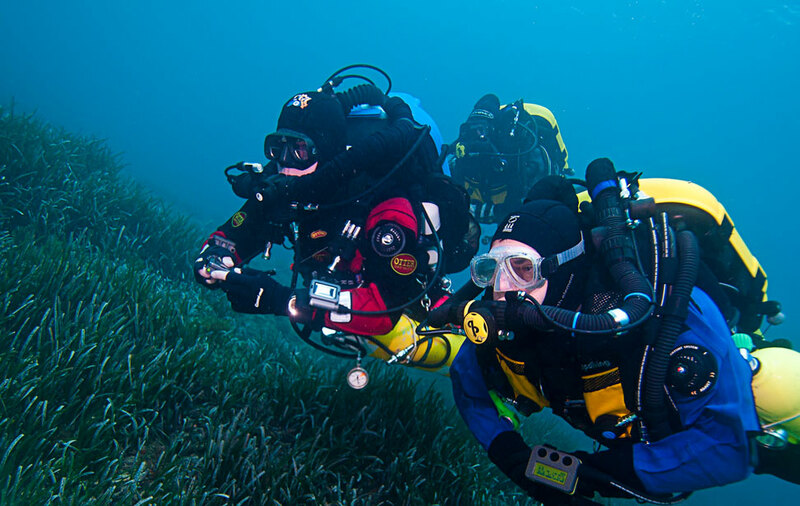 We dive all over the World: Our International dive trips are the stuff of legends! South Pacific, Microesia, The Red Sea, Galapagos, and all over the Carribean - You name it, we go there. And we set everything up for you! Continuing Education: We provide continuing education opportunities for certified divers, from Advanced courses and Specialties, all the way up to Master Scuba Diver and Divemaster! Reliable Rentals: Our Rental Equipment is state-of-the-art, high quality equipment that we service twice a year to ensure it is always in working condition! Trusted Service: Our factory-trained service technicians have, combined, over 50 years of experience. Scuba Equipment is, after all, life-support equipment! On-site Hydrostatic Testing:We will service your tanks, Hydro and Visual, in-house. No need to send it out to a third party! Certified Pure Air: We provide certified pure breathing Air and Nitrox (21% - 40%) for your scuba tanks. Self-Refresher:When your diving skills get rusty, you may use our heated pool to refresh your skills, free of charge. Try it BEFORE you buy it: Because dive equipment is specialized, life support equipment, it's important that you understand and are comfortable with the gear you purchase. We have never been interested in "making a quick buck" at the expense of our customers. We allow you to try any gear you plan on purchasing, in our pool, before you buy it. Ensuring it fits, is comfortable, and will satisfy your diving needs is our top priority, and you can't really know those things until you try it! The reason discount stores and internet equipment sources can sell dive equipment "cheaper" is because they do not provide these basic needs and services for scuba divers, thereby reducing the cost of running their business. These businesses are not concerned about you as a diver, they are simply concerned with making "a quick buck". ADI has always prided itself on providing the best possible experience for our customers. We are commited to doing everything we can to ensure you are able to enjoy this sport we all love to it's fullest extent. We thank you for your continued support and look forward to serving you for another 30+ years!